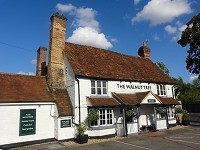 We'll be building up a list of places of interest local to The Walnut Tree that registered users can rate. This will help visitors to the area find the best places to go and might even provide some inspiration for us locals too. If you want more information on any of these, why not pop in and see us - we might have some further literature, advice or even discount tickets for some of them. Just five minutes away from The Walnut Tree, Cliveden House is a National Trust property with beautiful gardens and grounds for walks, boat trips in the summer and ideal for family visits. Hedsor House is a magnificent country house and a unique wedding venue, also most suitable for corporate events including team building and conferences. Whatever the weather, Odds Farm (just a few minutes drive from The Walnut Tree) is a great national attraction for families. With an extensive collection of animals to learn about as well as brilliant facilities for indoor and outdoor play this is a year round favourite. A collection of paintings in a unique gallery dedicated to Sir Stanley Spencer R.A. who lived in Cookham village. Regular exhibitions and walking tours. Our location near to the River Thames at Bourne End, Cookham and beyond as well as near to the Chilterns means we are perfectly situated for a range of country walks & as a dog friendly pub we extend a warm welcome to your walking companions too!